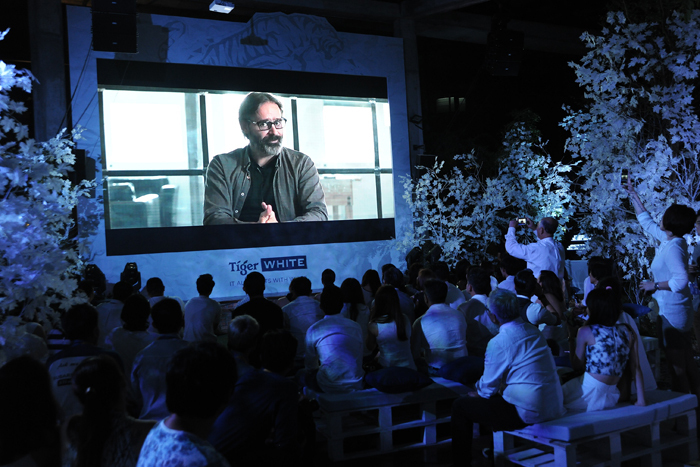 Drawing inspiration from the brew’s philosophy of ‘It all starts with white’ comes ‘Coaster’ – Tiger White’s first crowd-sourced film project made by Malaysia’s creative talents with mentoring by ‘Everest’ director, Baltasar Kormákur. DEC 19 – It was unexpected; the short film was shot in three days and resulted in a thrilling, suspenseful movie that had the audience of Coaster’s exclusive screening at Glasshouse at Seputeh gasping and applauding a job well done. The tale tells the story of a young chef faced with a vengeance dilemma: should or shouldn’t he plate up the perfect revenge when he was hired to cook for the very mobster responsible for his father’s death? Emcee Nadia Heng welcomes guests to the exclusive screening of Coaster held at Glasshouse at Seputeh on Dec 19. A special message from Everest director Baltasar Kormákur, who mentored the production of Coaster. Coaster’s cast and crew (from left): Lead actress Lynn Lim, lead actor Jonathan Lee, director We Jun, executive producer Daniel Ho and screenwriter Lim Benji. From left): Tiger Beer senior brand manager Joyce Lim, Tiger Beer marketing manager Jessie Chuah, Coaster lead actress Lynn Lim, Coaster lead actor Jonathan Lee, special guest Hong Kong actor Chapman To, Coaster director We Jun, Tiger Beer global marketing manager Amy Tay, Tiger Beer global brand director Wong Mie Leng, Coaster screenwriter Lim Benji and Coaster executive producer Daniel Ho. Hong Kong actor Chapman To made a special appearance at the exclusive screening of Coaster. Coaster was shot at locations around Kuala Lumpur. 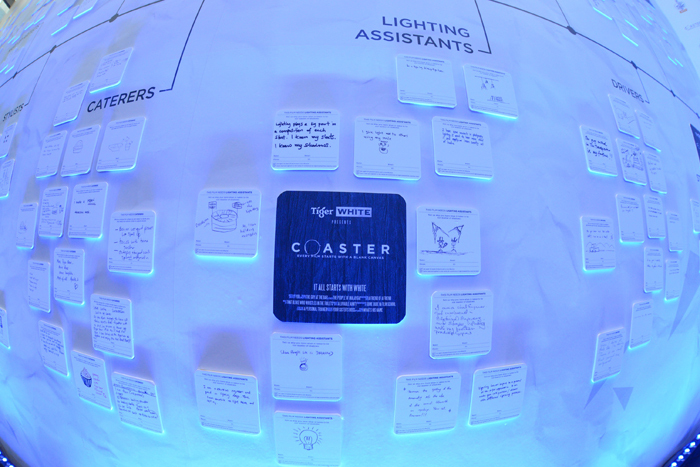 Typical with every film production, challenges were faced every day and overcame, providing an exciting taste of life on set for the 25 Coaster contest winners identified via the crowd-sourcing initiative mooted by Tiger White — Asia’s Wheat Beer. The introduction of Tiger White proves once again that Tiger Beer does not rest on its laurels and constantly pushes the boundaries of innovation, to create fresh and exciting brews for its consumers. Through Coaster, the all-new innovative product sets out to inspire young Malaysians to uncage their creative potential and to remind them that every great piece of creative work starts the same way. They just need to be brave and take that first step. A Q&A session with the cast and crew after the screening of Coaster. Sample coaster submissions to the crowd-sourcing initiative mooted by Tiger White for the world’s first film made from beer coasters. 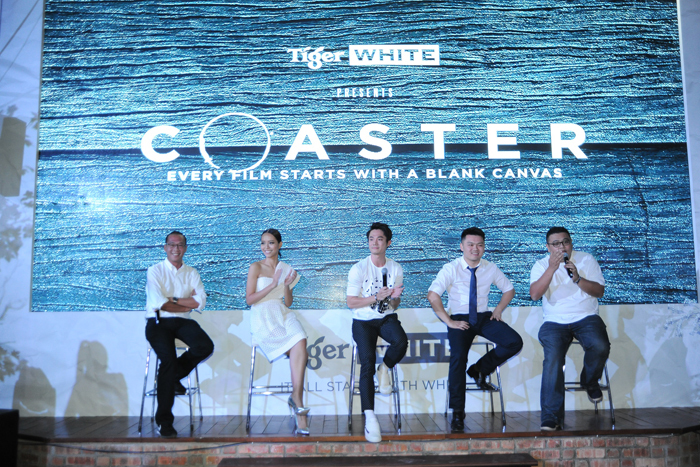 Tiger White brand ambassadors at the Coaster premiere held at Glasshouse at Seputeh on Dec 19. Guests having a good time at the after party of Coaster’s exclusive screening.